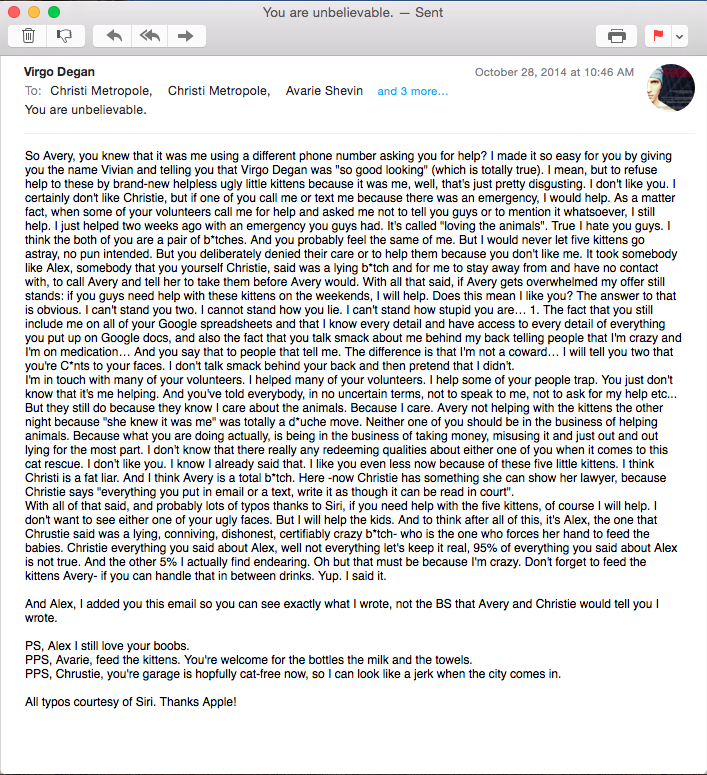 Who wants to read a SIZZLING email to Fat Christie Metroploe and her Leather Handbag Avarie Shevin from StraCatAlliance.org?? Yeah, you do. Take a look! PS, The Alex that I refer to is this crazy and awesome chick that runs the Pet Care Clinic on Slauson Ave in Los Angeles. She does a lot of good for a lot of animals. This Christie is the same mess “TNR” lady from StrayCatAlliance.org who has over 100 cats in her garage, illegal Veterinarian Meds- and an autistic man in her GARAGE (who she clearly takes advantage of. He is made to sleep on a cot in her f*cking garage with over 100 cats). Anyway, same b*tch. PPS, This email was in response to them bad-mouthing me (again, boo-hoo) and refusing to help (again) 5 newborn kittens because they were somehow connected to me (the people who found them called me first- who cares?) Alex (who Christi f*cked over pretty good this year and badmouths ALL the time, to everyone… just not as much as she does me, lol) made these two slags take the kittens- Period. PPPS, God D*MN I’m mean when I’m advocating for little Ugly critters! !